Sunday April 14th 1895 A beautiful Easter sunday. we went to church it was finely decorated with flowers. The exercises were by the children and choir. We went over to Woolfs for dinner and had a good visit. Charlie & Tishie were there. We stopped at home a little while to see Mother. I did my evening work and read a little. Monday April 15th 1895 I was busy all forenoon with the work. It looked like rain and did not set in after dinner. I worked on my old shalla dress I am going to fix over. Miss Linder came back tonight. Tuesday April 16th 1895 I had churning to do again today. I got a little time to sew. I took of a nice lot of chickens and in the afternoon set more hens. Will was in town awhile. Wednesday April 17th 1895 I was busy with the kitchen work all forenoon. We had early dinner and Will took me down town and on over home in the Surrey. I did my sewing work it was late when we had supper. Will Widenhoff came out here and Will bought "Belle" back from him for $75.00 We have been useing her for a week. [the following text is written vertically in the right margin of the above entry] I made a kettle of soap. 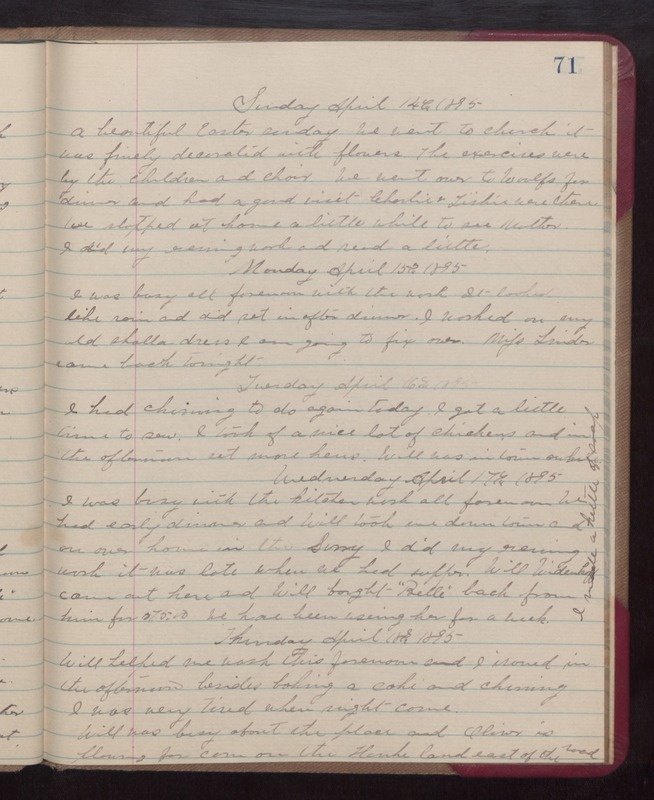 Thursday April 18th 1895 Will helped me wash this forenoon and I ironed in the afternoon besides baking a cake and churning. I was very tired when night come. Will was busy about the place and Oliver is plowing for corn on the Hanks land east of the road.